April 4, 2018 0 comments on "Canning Pickled Asparagus"
Yay! It’s asparagus season again. We have asparagus fields not even 10 miles from where we live and I have never gone to a farm to buy fresh cut asparagus. Well, this year I did, and I am so glad that I did. Time to learn how to can pickled asparagus. 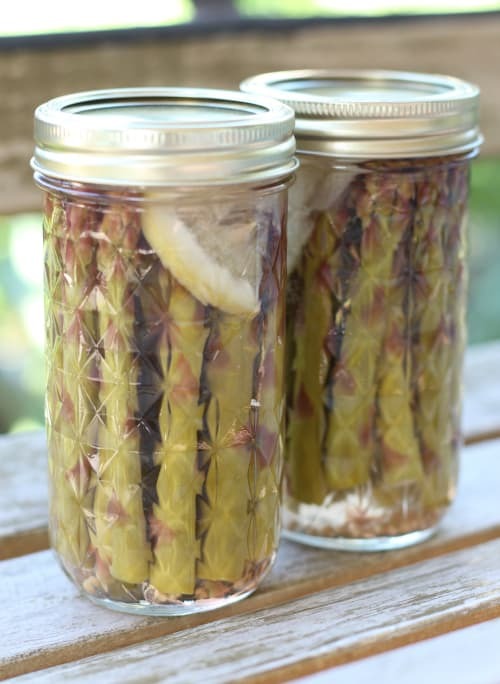 Pickled asparagus is one of my favorite easy pickling recipes. From April to June, during asparagus season, you can often find good deals on asparagus at the grocery store. You can often find it even cheaper at a local farm, and often it will have been cut the SAME day! You really need fresh asparagus to can pickled asparagus, or it just doesn’t turn out as well. I found a farm on Craigslist that doesn’t even cut the asparagus from the field until you call and place an order. It was $1.40 a pound for the asparagus, not bad. I went and brought home 35 pounds of the stuff! It was cut the same day I purchased it, and I canned it the next day. 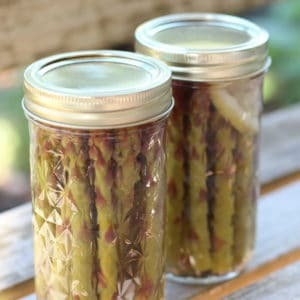 To make pickled asparagus you will not need a pressure canner (you do, however, need one to can plain asparagus). Because of the vinegar in the pickled asparagus, you can prepare it in a boiling water canner. Easy! If you look around for pickled asparagus recipes, you will see there are many different versions. Some recipes have dill in them, some of them have lemon slices added, and some of them have added onion or bell pepper slices added. There isn’t really a right recipe or a wrong recipe, it’s just a matter of taste. Here is the recipe I used. A couple notes first. This recipe makes 6 pints of pickled asparagus. You can double the recipe, but only make as much as your canner can hold at one time. If you have a standard sized boiling water canner, then just prepare one recipe at a time. Make sure to use pickling or canning salt, not regular salt. They are not the same. You can find it at the store next to the regular salt. You can use regular pint sized canning jars, or you can use tall 12 ounce jelly jars. The difference is that you will be able to have longer spears of asparagus in the taller jars. You will be surprised at how much of the asparagus you have to cut off to fit in the jar. First place the asparagus in a sink full of cold water with a little ice added to it. Let is soak for a few minutes. You will be surprised how dirty the asparagus is, and the dirt will fall right off. Run your canning jars, lids, and screw bands through the dishwasher to sanitize them, and place your canner full of water on the stove to heat up. Next trim the asparagus spears to fit into the jars. There should be about 3/4 inch between the top of the spear and the rim of the jar. Throw away the big tough asparagus ends, but save any small tender portions for freezing or canning. Before you pack the jars, place the water, vinegar, and salt in a sauce pan and put on the stove. Bring to a boil. When the water and vinegar solution have heated up, the jars are sterilized and still hot, and your canner is ready, you can pack the jars. Into each jar place one garlic clove and 1/2 tsp. of mustard seed. Pack the asparagus spears tightly into each jar, pointed ends facing up. Slide a slice of lemon down in next to the asparagus spears. Using a canning funnel and ladle, spoon the hot vinegar solution into each jar, leaving 1/2 inch head space. Wipe the rim of each jar with a clean towel and place lids and screw bands on each jar. Place jars in boiling water canner, and make sure there is at least 1 inch water above the tops of the jars. Bring to a boil again, if necessary, and process the jars for 10 minutes. Remove jars from boiling water canner and place on a towel on the counter until they cool. Make sure the jars are sealed before moving to storage. When you press down in the center of the lid, the lid should not spring back. These will store in your pantry for at least a year, but they will be ready to eat in 24 hours. I opened two jars the next day for a family get together and they all disappeared very quickly. Delicious! Don’t throw away all those little pieces you saved. You can put them in freezer bags and put them in the freezer or can them separately. Just place them in sterilized jars, fill with boiling water, and process in a pressure canner at 11 pounds of pressure for 30 minutes for pints or 40 minutes for quarts. Click here to learn how to can asparagus with a pressure canner. Follow my Canning and Preserving and Jams + Pickles boards on Pinterest.